Thanks to Dennis Marsh for passing along the news of the passing of a member of the Class of 73, Mike Satterly. 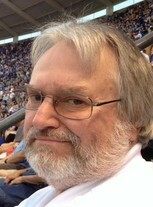 Michael Eugene Satterly, 54, of Leavenworth, died of natural causes Thursday, Nov. 5, 2009, at his residence. Mike was born Dec. 29, 1955, in Baumholder, Germany, to Eugene C. and Lavern P. Wallentinson Satterly. Mike attended schools in Leavenworth and graduated from Leavenworth High School in 1973. Mike married LeAnn Findeisen on Aug. 1, 1980, and from their union had one daughter, Echo A. Satterly. Mike had various jobs throughout his life, predominantly in the retail music industry. Mike was an animal lover and a companion human to one or two cats for most of his life. In his early adult years, Mike enjoyed softball and basketball and played on various city league teams. He was a huge University of Kansas fan. A lifelong collector of comic books, as well as music of all types, Mike was a walking music and movie trivia dictionary. He was a voracious reader and a very familiar face at the Leavenworth Public Library, visiting almost daily. Mike was preceded in death by his mother, Lavern, and his brother, Gordon Satterly. He is survived by his daughter, Echo A. Satterly of Lawrence, Kan.; his father, Eugene C. Satterly of Indianapolis, Ind. ; his brother, David P.
Satterly of Boise, Idaho; a grandson, Ian E. McCullough of Spring, Texas; and his nieces, Devan B. Satterly Penrod (Casey) and Alixe H. Satterly of Idaho. Mike was loved and will be sorely missed by his family and friends. In lieu of flowers, memorials may be made in Mike’s name to the Leavenworth Animal Welfare Society or the Leavenworth Public Library.